You can't beat a good old Christmas jumper at this time of year, it is super cold and what other excuses can you give to wear a light up jumper? I am right!! I have bought a new one every year for the past few years so I thought I would show you my collection. Not to mention on Friday 16th December it is Christmas Jumper day to raise money for Save The Children, I hope I can give you some inspiration for this year! You can't go wrong with a bit of Fairisle at Christmas, I just find it so simple, yet so festive. You could get away with wearing this every day and not get judged for being too festive ;) I bought this way back in 2012 in Primark and I have worn it every year!! Having a Santa on a jumper is a must, what is more christmassy than Santa? I mean that is what Christmas is all about right?? ahah kidding! I bought this in Primark a few years ago, and it has been an essential in my Christmas jumper collection. You have to have a Santa jumper! Move over Taylor, it's the Santa Squad..
Last but not least, I bought this adorable tee from ASOS, in the run up to Christmas my work will have dressed days and it will get super hot in a jumper so a nice t-shirt is just perfect!! I know this is all about the jumper but I love the slogan, it reminds me of when my sister and I pretended to be an elves when we were younger!!! Major throwback!! I have been wearing all off these in rotation the last few weeks and it just puts my in such a good mood, you can't beat wearing something Christmassy!! We haven't got long now, so exciting!! Let me know where your Xmas jumpers/tees are from?? love seeing what Christmas jumpers everyone has! lovely collection! 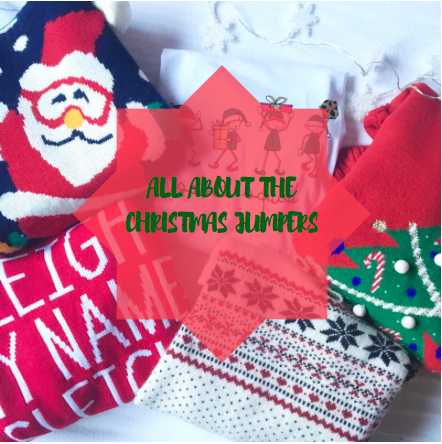 Love this post, i'm obsessed with christmas jumpers they're just so cosy and fun! These are so cute and festive! Love the first one! I love that Asos top, got to be the cutest christmas top I've seen! I love how you have an entire collection! I've just bought my first one- it has a dog with a scarf and santa hat on it! Primark seriously do the best jumpers! I love all of these!! Absolutely love the 'santa squad' tee, ASOS always kill it with their Christmassy range! Can't say no to a good light up jumper either haha, they're always so tacky but super perfect for this season! That fairisle jumper you have looks like a really pricey one, can't believe you picked it up in Primark! I love the top from ASOS! I've just bought my first Christmas jumper this year! Wow you have so many! We did Christmas jumper day today and I went for a penguin t-shirt :) I used to hate them but I've grown to love them because I'm forced to wear a Christmas top every year now! I seriously love your collection! Such an amazing collection!!! LOVE the sleigh my name and the squad one! I haven't worn any special christmas jumpers or anything yet! This weeks the one though!! Cute jumpers! I'm not a big Christmas jumper fan but these are lovely. The Fairisle ones are lovely!